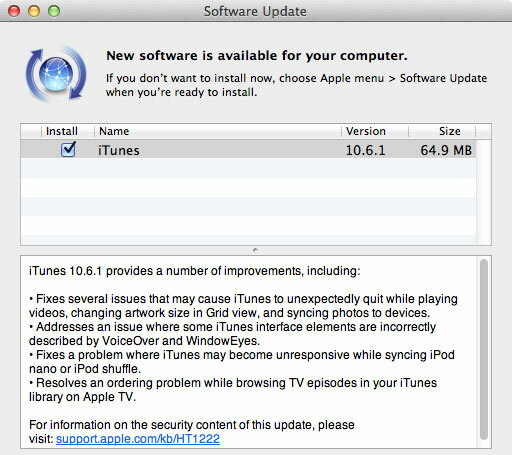 Apple has released an iTunes 10.6.1 update which comes with some minor bug fixes. – Fixes several issues that may cause iTunes to unexpectedly quit while playing videos, changing artwork size in Grid view, and syncing photos to devices. – Addresses an issue where some iTunes interface elements are incorrectly described by VoiceOver and WindowEyes. – Fixes a problem where iTunes may become unresponsive while syncing iPod nano or iPod shuffle. – Resolves an ordering problem while browsing TV episodes in your iTunes library on Apple TV. The update is available through iTunes Software Update.Or you can download iTunes here.